My Adobe Acrobat used to print fine, but all of the sudden it printed garbage or garbled letters on some but not all pdf’s that it made or printed. I like to save my emails off as pdf’s as documentation or even save websites at a specific point in time, so use the Acrobat as a printer feature. Since I save of lot of documentation as pdf’s (like emails, receipts) this problem was vexing me until I figured out the answer. Since Adobe kept doing updates, I think the default settings got reset. And it happened on 2 different PC’s at about the same time, so I know it was not just me. It also happened on both Adobe Acrobat 9 and also Acrobat X (2 different PC’s). Turns out Acrobat (I was using Acrobat 9 at the time) had changed the default setting to use “system fonts only, do not use document fonts”. There are two ways to change it back- On- the- Fly version - one is per each time you print a pdf and the other fixes it permanently. On- the- Fly version: When you are in a program and want to print to a PDF file, you select Print Preview, Printer Properties and this screen pops up. 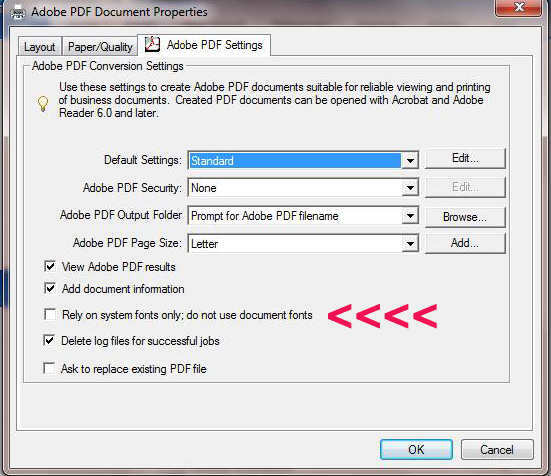 On the ADOBE PDF settings page, UNCHECK, Rely on System Fonts, do not use document fonts. Then hit OK. If you want to change it permanently, when in Windows Vista or Windows 7, click on the start button on the lower left. Select Devices and Printers or Control Panel, then Printers . You should see the Adobe PDF showing up as a printer. Right Click on the Adobe PDF icon (picture), and select Printing Preferences. As above, on the ADOBE PDF settings page, UNCHECK, Rely on System Fonts, do not use document fonts. Then hit OK. This should allow Adobe Acrobat to use all the fonts in the document and not print garbles or garbage pages when you really want just the “Page as is”.